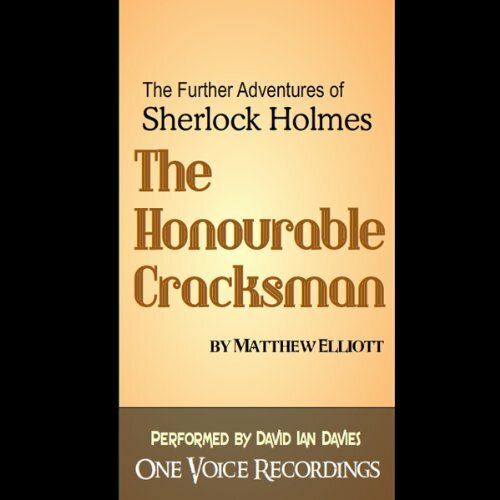 British writer Matthew Elliott takes up the formidable challenge of expanding the Sherlock Holmes canon with his marvelous original story "The Honorable Cracksman". After a burglar discovers a cadaver lodged in the chimney of a home during a break-in, he engages Holmes to solve the mystery. As the investigation wears on, the detective finds himself at the office of his elder brother, Mycroft, a government official. It appears that how the man died is of paramount importance to uncovering the facts of the case. David Ian Davies delivers a superb performance that is equal parts disquieting and riveting. One Voice Recordings' presentation of Matthew Elliott's excellent new Sherlock Holmes pastiche. Holmes is contacted by a cracksman, or thief, who has entered a residence to commit a 'routine' crime and found a decaying body stuffed in the chimney. Holmes' investigation leads him to the governmental office of his older brother, Mycroft, as the case takes on larger and more ominous dimensions.